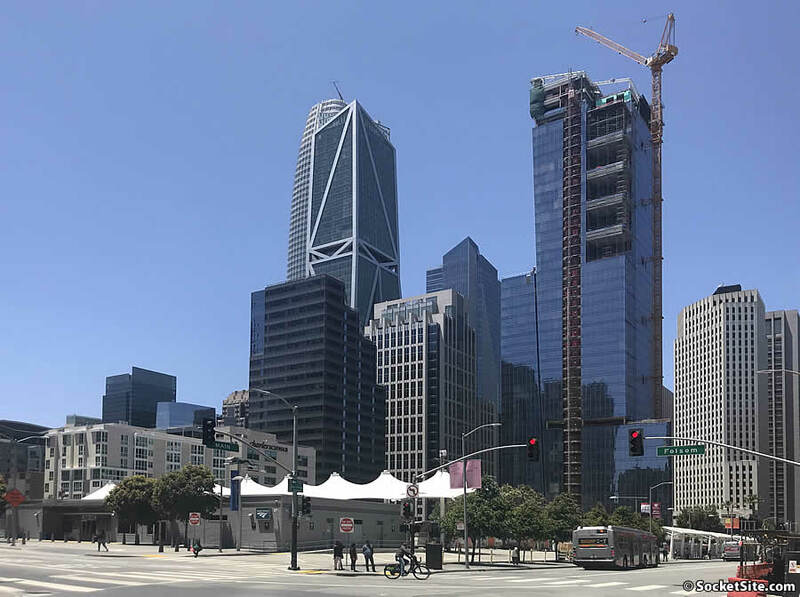 A request for proposals to build around 240 units of affordable housing on the southern third of San Francisco’s Temporary Transbay Terminal Site, at 200 Folsom Street, between Beale and Main, is about to be issued by San Francisco’s Office of Community Investment and Infrastructure. As roughly massed below, the Transbay Block 2 development is expected to rise up to 165 feet in height along Folsom, with townhomes behind and adjacent to a new mid-block Transbay Park which will occupy the middle third of the Temporary Terminal site, the groundbreaking for which has been pushed back to sometime in 2019. And once again, between the time that the temporary terminal is shuttered and the ground is broken for the 165-foot-tall Block 2 development, the temporary terminal building on the site will be re-purposed as a sales office for Tishman Speyer’s twisty 400-foot-tall tower and podium development that’s under construction across the street on Transbay Block 1, with a lease that’s currently slated to run through the first quarter of 2020. Why so low-rise? You’d think 500 or so feet would be appropriate there. Obviously, the shadowing impact upon the park precludes such development there; FYI, the northernmost strip (Block 4) is zoned for such heights as you suggest. The Transit Center rooftop park is going to be significantly impacted by the shadowing from the buildings immediately adjacent to its southern edge. 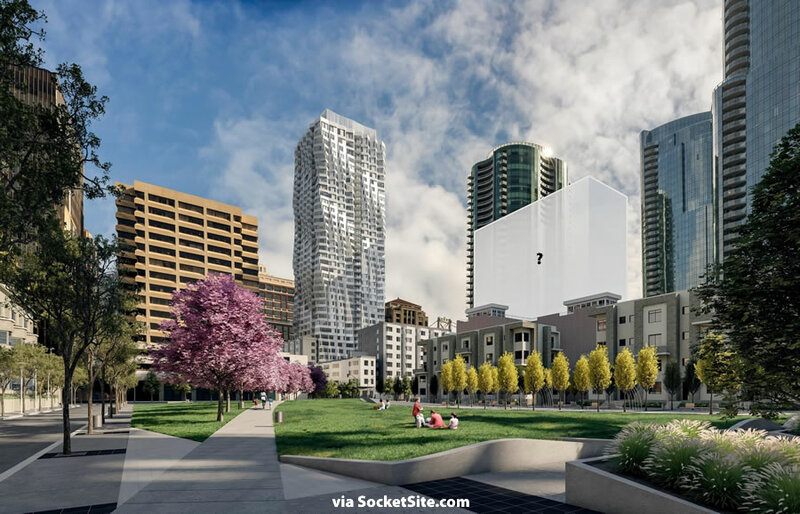 Transbay Park is going to be a South FiDi gem and will become a favorite of residents and workers. Perhaps so sun has a chance of making it to the park. And across the street in an area of the same size as here, Tishman is able to squeeze 396 units (of which 156 are BMR) vs the mere 240 units of affordable housing here. With this park, Oscar park, and the 2nd/Howard park, there will be much less demand or incentive to trek up to the Transbay roof park. I actually think a bit more scarcity would help the success of the Transbay park. Great point and regarding the 2nd and Howard Park, it’s a bad waste of prime building lots (as your point illustrates). I really wish they would cut out that park for development. More than enuf nearby newly created open spaces, and with YB gardens a block away in the other direction…they should develop 2nd and Howard. IMO. I believe the subterranean DTX precludes that type of development on those lots which actually have to be cleared of the current buildings for just that reason. How many days of the year is Salesforce Park going to be closed to the public for Salesforce private events? The rooftop park will likely be private events as often as possible to pay the bills, in my opinion. I wouldn’t count on it being open to the public most nice weather weekends from May to October. This planned park is sorely needed – hopefully 5,000 square feet can be dedicated to a playground similar to the one the community got built at Sue Bierman Park since there are several daycare centers at the nearby office buildings with hundreds of kids who have to be chain gang walked much further today to get a public playground. All parks in SF are technically closed dusk ’till dawn, but with controlled access, this will be more easily enforced there. I’m not so sure I agree with this. This park I think is going to skew much more “neighborhood” for the residents of newer construction, whereas Transbay is going to be more of a tourist attraction for its novelty as well as service workers for the buildings attached and adjacent. 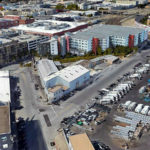 What’s the approximate cost per unit of a 165′ “BMR” building, as opposed to the wood-frame construction used for most BMR projects elsewhere in the city? Is this a good use of the city’s affordable housing funds? Cement is required beyond a certain height, but given that it’s more expensive, you probably need to up a certain number of floors beyond wood limit in order for financing to be viable.